Mir Mahfuz Ali was born in Dhaka, Bangladesh, Mahfuz is a performance artist, renowned for his extraordinary voice – a rich throaty whisper brought about by a bullet in the throat fired by Bangladeshi policeman trying to silence the singing of anthems during a public anti-war demonstration. He studied at City Literary Institute in London and Essex University. He dances, acts, has worked as a male model and a tandoori chef. He has given readings and performances at the Royal Opera House, Covent Garden; Bedlam Theatre at the Edinburgh festival; New End Theatre in Hampstead; Tricycle, Arcola in London and at the National Theatre (Cankarjev Dom) of Slovenia in Ljubljana,. His poetry appeared in the anthologies The Silver Throat of the Moon, and Whispering In The Wind, and also in the Index on Censorship magazine and in the magazine Exiled Ink! His work has appeared in Ambit and the London Magazine. 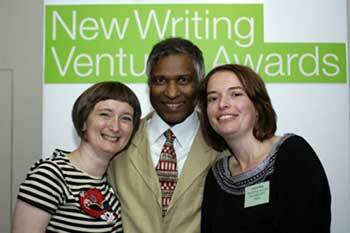 In September 2007 he was amongst the final three poets shortlisted for the New Writing Partnership Literature Awards (see photo). A first-hand account of Zimbabwe’s deterioration, the story of a lesbian tracing her family to a concentration camp, and a tale inspired by a box of letters found in Deptford market. The subject matter may differ vastly, but the works have one thing in common: they were all written by women. The shortlist for the coveted New Writing Ventures Award announced today is dominated by women, with an unprecedented eight out of nine places taken by female writers. In the three categories of fiction, creative non-fiction and poetry, only one man is left in the running, the poet Mir Mahfuz Ali. He advocated a concerted effort to encourage new male authors, akin to the support given to women. “Male writers seem to be under-supported and under-represented, and they need encouragement somewhere along the line,” he said. “Maybe we need an Orange Prize for men”. Char March, one of the writers shortlisted for the fiction category, said she was “delighted” to hear of her nomination, and the female-dominated line-up. “I hope it shows that the establishment is opening up to the fact that women write damn good stuff and are not just interested in chick lit,” she said. March, whose book follows the lesbian love affair of a woman who traces her family back to an east German concentration camp, believes that part of the reason women were less successful in the past was that they had not mastered the narrative drive. “Women are trying to write books that are more gripping now. I think in the past, because thrillers were seen as typically male, women didn’t have such a grasp on narrative drive as they do now, and that stopped them from being as successful,” she said. Ali said he was “not surprised” that he was the only male poet nominated. “Women have a better feeling for poetry than men because they feel things more deeply,” he said. “I don’t feel threatened, I think it’s wonderful.” Ali, 50, who grew up in Bangladesh during the liberation war, puts his own sensitivity as a poet down to the hardships he suffered as a child. He was shot in the throat by Bangladeshi police while singing a protest song aged just 13, and has taken 30 years to fully recover his voice. It was through poetry that Ali was able to express his feelings about the atrocities he had witnessed. “Having suffered many setbacks and pain, including near death, I have grown stronger and been able to reflect on the experiences,” he said. His poetry gives a vivid eyewitness account of some of the horrendous scenes to which he was privy. “I saw the genocide and the tsunami with my own eyes, and I witnessed the shooting of a baby. I was there when no cameramen were there, so I was the camera, taking pictures with my poetry,” he said. The awards, which are now in their third year, have become a golden ticket to lucrative publishing contracts for emerging authors. Success stories include the 2005 runner-up, Liz Diamond, who has two book deals with Picador, and the 2005 winner Nicholas Hogg, whose novel Show Me The Sky will be published by Canongate next year. The overall winners will be announced on 11 September. A Bangladeshi performance poet with an extraordinary voice – the result of a bullet in the throat from riot police attempting to silence a singing protest – is the only man to appear on the New Writing Ventures awards shortlist for emerging literary talent. Mir Mahfuz Ali arrived in London 20 years ago seeking medical treatment and political refuge and found a new voice through poetry. Part of Exiled Writers Ink, a group of émigré authors who fled war-torn and repressive countries, and a regular reader at literary festivals, he is now in the running for a £3,000 prize with his shortlisting in the poetry category of the New Writing Ventures awards. and a long, slow kiss.